Another earnings season is around the bend and it’s shaping up to be another good one. As we’ve repeatedly mentioned over the last 6 quarters the environment is and remains particularly ripe for profit outperformance. The trends that have been in place for the last 6 quarters remains largely intact. Analysts remain woefully behind in terms of raising their estimates (see here) and corporate profits remain a margin story. 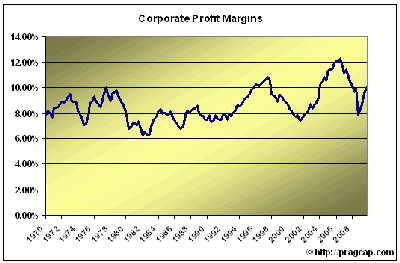 Figure 1 shows the corporate profit margin over the last 40 years. Most important in the last few years is the turnaround in margins since Q4 2008 when enormous cost cutting campaigns kicked in. The one remarkably positive sign during this recession has been the ability of corporations to remain lean and mean. They have done a superb job in cutting costs and maintaining a fairly robust bottom line. 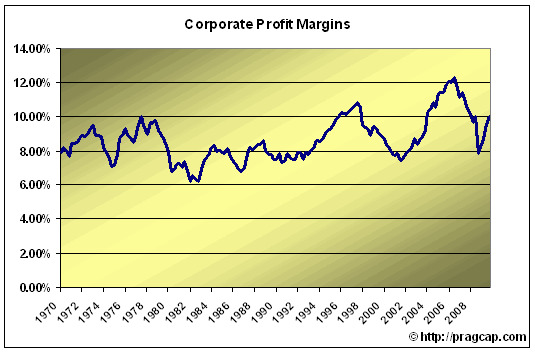 As you can see, profit margins are surging in recent quarters and should continue to trend higher as unit labour costs remain low (see figure 2) and revenues begin a slow rebound (the extent of this revenue rebound will be the key driver of any future market performance). This trend has continued this quarter and should help power another quarter of “better than expected earnings”. While revenues have certainly bottomed it remains the key missing ingredient in the recovery. In order for stocks to continue their record breaking trajectory we must begin to see revenue growth. According to recent jobs data it looks like the labour market is beginning to firm. This is a clear sign that companies are beginning to see more stability in their top-line growth. This also means companies are beginning to incur extra costs and the margin story will cease to be the primary driver of earnings without equal or greater revenue expansion. One bright sign here is that revenues significantly lagged the equity market rebound during the 2003 recovery. As you can see in Figure 3 revenues didn’t substantially recover until 2004. We’re seeing the same thing occur with this recovery although the extent of the rebound in revenues remains questionable as consumer balance sheets remain underwater and the global economy continues to drag itself out of recession. Perhaps most important in all of this, however, is expectations. As we mentioned earlier, analysts have been woefully behind the earnings recovery. This is best reflected in our expectations ratio which had been trending higher since just before the market bottomed last year and only recently began to roll over. This shows that analysts estimates are becoming increasingly in-line with actual earnings and could create an environment that is not quite so friendly to the usual “beat and raise” environment we have all become accustomed to. If a strong revenue rebound fails to materialise in the back half of the year analysts estimates will prove too high and stocks will respond negatively. Based on my analysis, I believe we are in for one more quarter (Q1 2010) of easy analyst comparisons and then the heavier lifting begins as estimates ratchet up in Q2 2010 and even higher in the back half of the year where analysts estimates are very optimistic. If we don’t see a stronger rebound in revenues in the next two quarters companies will not match these optimistic outlooks. Currently, the market appears to be front-running the current earnings season and is pricing in another very strong earnings season. Don’t be shocked to see another quarter of very high percentage earnings beats and tepid revenue performance. Whether that is enough for an already optimistic market remains to be seen. My guess is we will see another “sell the news” earnings season. Companies are running out of tricks to pull from the cost cutting bag and revenues haven’t quite stabilised to the extent that would make most executives highly confident in their full year earnings. If we don’t start seeing a pick-up in top-line growth this market is not going to be celebrating for long and the recent optimism in stocks will be proven wrong.